When Thomas Jefferson became President, there were sixteen states in the Union. In 1801, the USA consisted of the original thirteen colonies, plus Vermont, Kentucky and Tennessee. By the terms of the treaty ending the American Revolution, the US gained the Northwest territory, what is now Ohio, Michigan, Indiana, Illinois, Wisconsin and part of Minnesota. It also gave the USA free navigation rights on the Mississippi River from Canada to the bustling port of New Orleans. 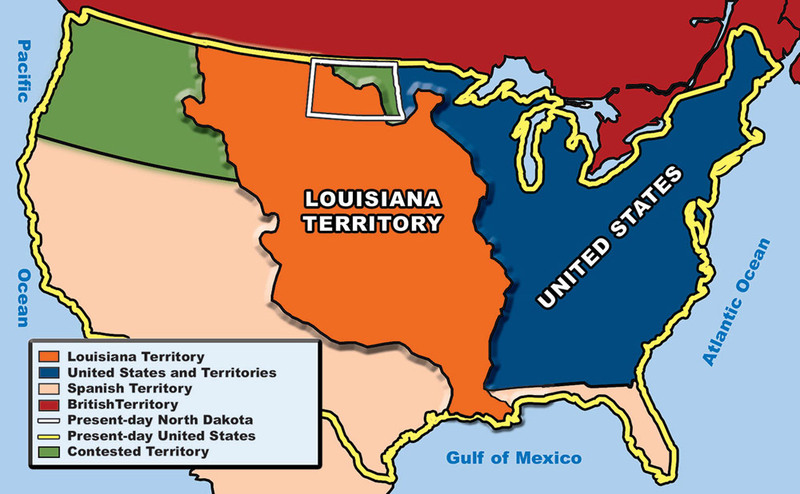 The USA at the time of the Louisiana Purchase. But we were not alone! Great Britain claimed most of Canada, with which we maintained a cautiously respectful relationship. Spain had claimed nearly all of the Western Hemisphere three hundred years earlier, and still claimed Florida, which at the time included part of today’s Alabama and Mississippi. But Spain’s might and influence had declined, and they paid scant attention to their USA possession. Even their vast near-Empire via Mexico, including much of the present-day Southwest up through California, was semi-neglected by Spain. France had planted its flag encompassing more or less the middle third of the USA and pieces of Canada back in the 16th Century. After the Seven Years War (1752-9) with Great Britain (the French and Indian War to Americans), the entire territory was ceded to Spain – except for New Orleans, which remained French. All this was complicated by fuzzy boundaries and some up-for-grabs. Plus countless native tribes at various locations we knew practically nothing about. There was no doubt about Thomas Jefferson’s deep affection for France. Sent to represent Congress in the 1780s, he spent five years in Paris and grew to love all things French. When our great ally for American independence fomented its own revolution, he was overjoyed and happy to provide whatever he could to help chart its new direction. 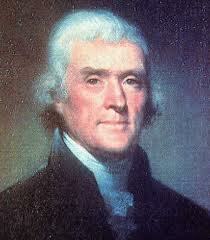 As the French Revolution devolved into the Reign of Terror, Jefferson, like most Americans, was dismayed and concerned. By 1801, Napoleon Bonaparte was making everyone uneasy with his military adventuring all over Europe. One of those “adventures” re-ceded the Louisiana Territory (the middle third of the US) back to France. Things were growing more complicated. In 1803, Napoleon was approaching the height of his power. Small trading posts and villages had cropped up at various locations along the Mississippi, and commercial river traffic was increasing as more US settlers trickled westward. New Orleans had grown into one of the continent’s busiest ports, and deemed vital to US interests. With France now having a much larger presence on the continent, both we – and the British – were becoming understandably nervous. In early 1803, the opportunity arose for the US to purchase New Orleans and was received enthusiastically by everyone – including Napoleon. Congress was unanimous, and authorized $10 million for the transaction. Then Congress adjourned until November. President Jefferson dispatched Robert Livingston to Paris to begin negotiations. 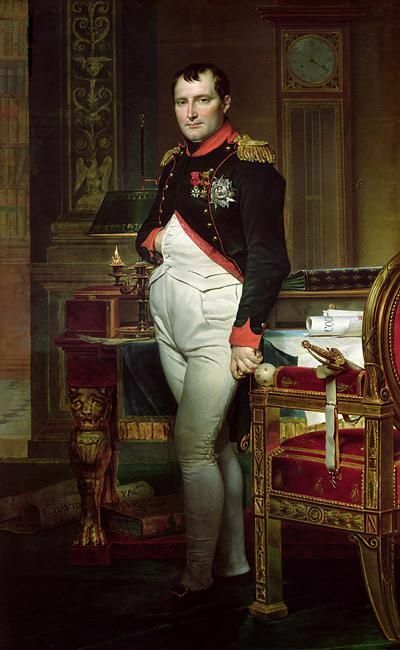 Meanwhile, Napoleon, having risen to great power in France, realized that (a) his future opportunities, goals and plans were centered in Europe; (b) he had little time or energy to devote to his American interests , and (c) he needed money to finance (a). He offered to sell the United States the entire Louisiana territory, from the Mississippi River to the Rocky Mountains and from the Gulf of Mexico to Canada. Jefferson immediately sent James Monroe to Paris to work with Livingston to facilitate the larger deal now on the table. One must never be simplistic regarding the mind of Thomas Jefferson. As one of our most complex Presidents, he did not have a simplistic bone in his body. Politically, Jefferson did not favor a strong central government. Conversely, he envisioned a country of yeoman farmers, to whose judgment most matters could be referred, i.e. strong local (state) governments. To his way of thinking (and what became the core of the Democratic Party for the next half-century), the Constitution assigned specific functions to the federal government. States Rights prevailed otherwise. Thus Congress, elected by the states, was dominant. Jefferson was torn. As he saw it, the President had no authority to agree to up the ante to include the entire Louisiana Territory, more than 825,000 sq. miles, at a greater cost to be determined – no matter how good the deal was. He insisted that a Constitutional amendment was needed, and drafted suggested language. Secretary of State Madison was the premier expert on the US Constitution. 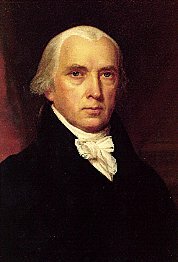 His close friend, Secretary of State James Madison argued tirelessly against the need for an amendment. Madison arguably knew more about the Constitution than anyone in the country, and claimed that the elasticity of the law and its implied powers allowed for this type of action. Besides, the mechanism for proposing and ratifying a Constitutional amendment was complex and time consuming. There would be political opposition, and no guarantee it would pass. But perhaps the most “simplistic” factor was the deadline for the purchase: the offer expired on October 31. Use it or lose it. Deeply torn between his personal (and well known) ideology and a phenomenal deal, he had to jump on it! Kit and caboodle, it was negotiated down to only $15 million. The best land deal ever!! A prescient metaphor to explain the reasoning behind a complex or controversial issue can be very effective from time to time – especially if the creator of the metaphor has the wisdom and wit to hit the nail on the conceptual head. 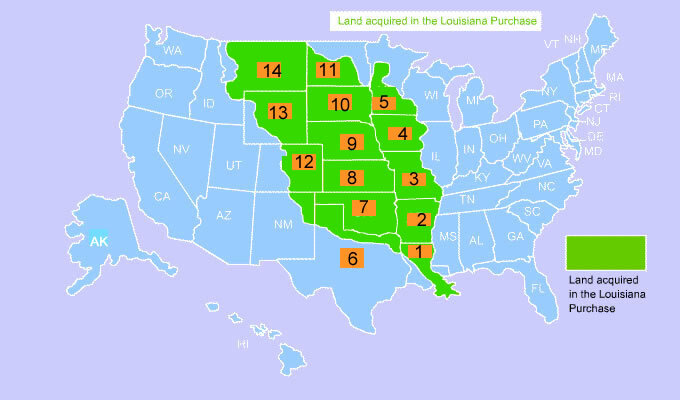 Fifteen states or parts thereof would be carved from the Louisiana Territory, bloodlessly doubling the size of the country, at a cost of only 4 cents an acre. Mr. Jefferson did it for our own good. This entry was posted in A POTUS-FLOTUS Blog, Thomas Jefferson and tagged American history, Composition of the Louisiana Purchase, Feather Schwartz Foster, history, James Monroe, Napoleon Bonaparte, President Thomas Jefferson, Presidential history, Robert Livingston, The Louisiana Purchase, The Louisiana Territory, Thomas Jefferson, US history, White House history. Bookmark the permalink.